ATLANTA – March 3, 2015 – Labor and employment law firm Constangy, Brooks & Smith, LLP announced today that nationally-recognized attorney Donald Prophete is joining the firm which will now be known as Constangy, Brooks, Smith & Prophete, LLP. Eleven other attorneys from across the country are also joining the firm, which will add offices in Denver and New York to its 25 current locations. The new attorneys come to the firm with a wide range of backgrounds and are part of a concerted effort by Constangy to remain well-positioned to represent employers in the challenges they face in a more tech-savvy, diverse workplace environment. The firm’s new Denver office will be led by Jim Goh, along with Steven Moore, both previously shareholders at Ogletree Deakins. The firm is also opening an office in New York, and will name the leadership for that office in the coming weeks. In addition to the new offices, new partners have joined the firm in Kansas City, Los Angeles and Princeton. Richard Bromley joins the Los Angeles office, coming from Nixon Peabody. Robert Seiger joins the Princeton office, coming from Ogletree Deakins. Prophete will continue to practice in Kansas City, along with Nikki Howell and Nicholas Walker, all of whom were previously at Littler Mendelson. In addition to the new partners, Glenn Bunting joins the Atlanta office as senior counsel, coming from FordHarrison. Deborah Hembree joins the Birmingham office as senior counsel, coming from Balch & Bingham. Dawn Amos and Jessica Tsuda are joining the Denver office as associates, both coming from Ogletree Deakins. Stephanie Underwood joins the Princeton office as an associate, coming from Locke Lord. Constangy, Brooks, Smith & Prophete, LLP offers a wider lens on workplace law. We have counseled employers exclusively since 1946. 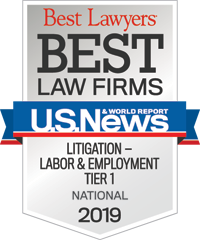 With offices in 16 states, we are one of the largest labor and employment law practices in the U.S. Constangy holds a national Tier 1 ranking from the U.S. News & World Report/Best Lawyers Best Law Firms survey, and has been called a “go to” law firm by Corporate Counsel andFortune magazine. Many of our more than 150 attorneys have been recognized by leading authorities such as Chambers & Partners, Best Lawyers in America and Martindale Hubbell. Find out more about us online at www.constangy.com or follow us on Twitter @ConstangyLaw.